Connective tissue dysplasia (CTD) is a heterogeneous group of connective tissue diseases of a polygenic-multifactorial nature, united in phenotypes on the basis of a commonness of external and / or visceral signs. A whole series of articles is devoted to the problem of CTD in children. In the article “Hereditary and multivariate connective tissue disorders in children Algorithm of diagnosis. Management tactics”  provides the Russian recommendations developed by the expert committee of pediatric group «connective tissue dysplasia» at the Russian scientific society of physicians. The draft Russian recommendations presents modern provisions relating to the issues of terminology and the causes of inherited connective tissue disorders, general and pediatric aspects of diagnosis, including step by step diagnostic algorithms of connective tissue dysplasia and dysplastic phenotypes, management tactics and treatment, clinical examination of children and adolescents with hereditary disorders of connective tissue. In the article “Multiorgan disorders in connective tissue dysplasia in children. Algorithm of diagnosis. Management tactics. Draft of Russian recommendations. Part 2.”  was adopted at X National Forum with international participation «Children’s health: prevention and treatment of socially significant diseases», May 11, 2016 in St. Petersburg, presents the data on the diagnostic features and treatment of the manifestations of connective tissue dysplasia in pediatric cardiology, nephrology, gastroenterology, pulmonology, hematology, orthopedics and in other sections of pediatrics. In the article “The manifestation of the connective tissue dysplasia syndrome in children with musculoskeletal pathology”  was presented the facts about the peculiarities of manifestation of the connective tissue dysplasia syndrome in children living in conditions of the Far North of Russia. By examination of 173 children from orphanages of the Magadan region the prevalence and manifestations of the CTD syndrome was determined. In the groups of indigenous children and migrant populations significant differences in the manifestations of the studied syndrome were revealed – higher frequency of manifestations of CTD in non-aboriginal population, which may be associated with the effect of adverse climatic and geographical factors determining the development of the syndrome in the child’s body non-adapted to the conditions of the Far North. In the article “Morphological investigation of connective tissue dysplasia in pediatric surgery”  was determined accessible and highly specific morphological research techniques for diagnosing the severity of the connective tissue dysplasia (CTD) in children with hernias of the anterior abdominal wall. The main group consisted of 54 children with unilateral inguinal hernia, which had CTD of moderate or severe degree. The control group was formed of 36 patients with unilateral hydrocele, who had no CTD or had mild CTD. Children underwent a standard correction of the hernia or hydrocele with taking hernia sac / vaginal processus of the peritoneum. 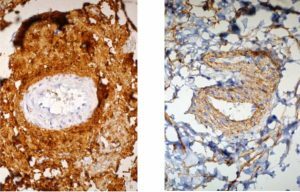 Operating material was studied morphologicaly: silvering by Foote, three-colour staining by Masson, immunohistochemical reaction to antibodies of Collagen I and IV Type. The study of morphological changes revealed the presence of significant changes (χ2 = 41.3, p = 0.001) in the structural changes of the connective tissue of the patients in the main and control group. For the morphologic diagnosis of CTD in children with inguinal hernia immunohistochemical study of collagen I and IV is the most reliable method. At the same time, technique of silver impregnation by Foote and three-colour staining by Mason has high diagnostic informative value during routine histological examination.